This has been quite a journey of trusting in Divine inspiration and my faith in bringing forward this painting. 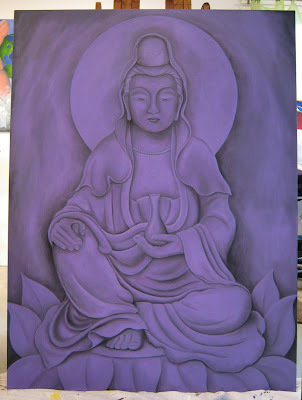 Kuan Yin, Bodhisattva of Compassion, has been my muse throughout the process and I give thanks for her guidance. As she nears completion, Mary—the mother and Magdalena—have been calling to me. A natural flow born of the birthing energy that is building as we move into spring and this time of resurrection as the earth blossoms in all her glory after the dark of winter. See my last post for the amazing cherry tree photos! Slow pace in the studio these days as is the rhythm of the Earth in winter. 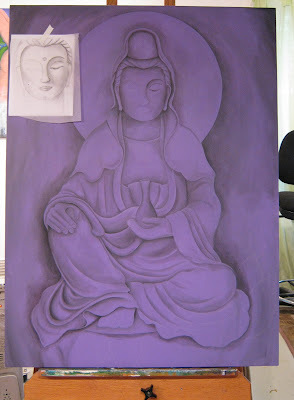 Kuan Yin is my muse as I continue bringing her to life on the canvas. Goddess of compassion, “She Who Hears the Cries of the World.” Listening to Jennifer Berezan’s “She Carries Me,” a long chant to Kuan Yin and the Divine Mother, while I work—evoking the energy and compassion of this bodhisattva.